The revised BMW X3 plays spot-the-difference with, on the outside at least, BMW having done a pretty convincing job of turning it into an X5 lookalike. 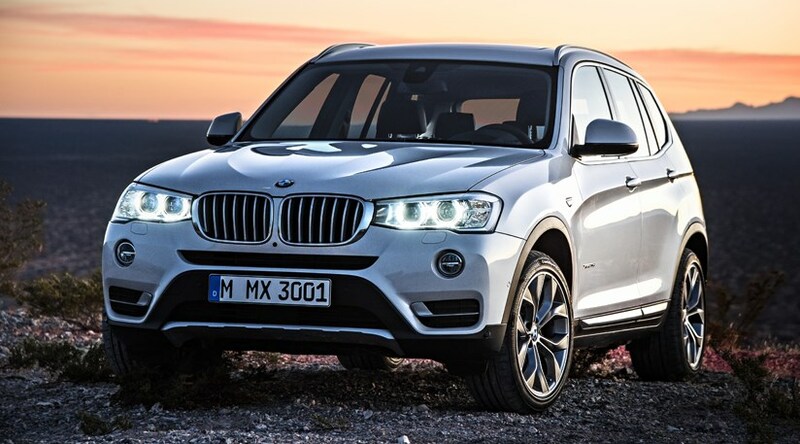 The new X3 goes on sale in June 2014, costing from £31k. The facelift looks subtle – let’s concentrate on the BMW X3’s engine tweaks. The X3 has an all-diesel line-up, teamed with either a six-speed manual gearbox or an eight-speed automatic. Rear-wheel drive (sDrive, in BMW-speak) is available on the most basic model with 4x4 ‘xDrive’ standard on the rest of the range. It’s no surprise that the least powerful, slowest X3 is also the cheapest. The X3 sDrive18d only has 145bhp and 265lb ft, but BMW claims it’ll do as many as 60.1 miles per gallon of diesel burned, and only emits 131g/km of CO2. That makes it more efficient than the diesel XC60, Audi Q5 or Land Rover Freelander. At the other end of the scale, there’s the X3 xDrive35d. Okay, it’s no M Division monster, but with 309bhp and 465lb ft on tap from its turbocharged straight-six, it’s no slouch. Who needs to do 0-62mph in 5.3sec and 155mph in an X3? If that sounds like your sort of SUV, you’ll have to stump up around £41,000. Even if you’re more pragmatic, the entry-level X3 has seen a £2020 price hike, starting at £30,990. That means it’s a few hundred quid more than the XC60’s starting price, but you’ll have £600 change against a diesel Q5. How is BMW justifying an extra two grand for an X3? You now get heated seats, an automatic tailgate and BMW ‘business’-spec sat-nav on every model. That’s in addition to leather seats, climate control, cruise control, DAB radio, 17in alloy wheels, front and rear parking radar, automatic wipers, and automatic lights. For every model except the top-spec xDrive35d, there’s now an optional 17in ‘aero’ wheel design, which helps shave another 7g/km off your CO2 emissions, and, indirectly, your tax bill. What exactly has changed, visually? Reprofiled headlights, extra chrome, bigger ‘kidney grille’ nostrils, and massaged front and rear bumpers. Naturally, there are new alloy wheel designs to choose from, myriad leather and trim finishes, and even a new ‘xLine’ trim level for a more butch, utilitarian look (as seen in our gallery). So, it’s more efficient and better kitted out, but looks more like the ugly X5 and costs a chunk more than before too. Would the BMW X3 be your pick of the family SUV class? Add your thoughts in the comments below.